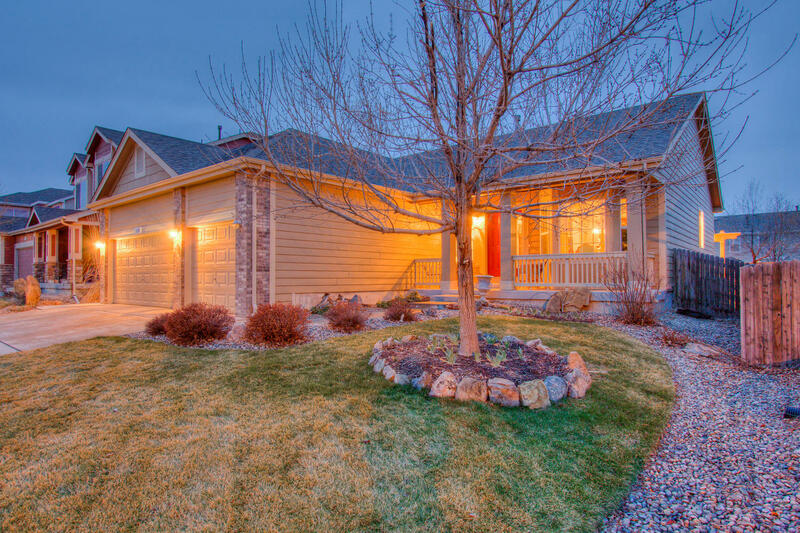 Looking for that perfectly customized, impeccably maintained Open Ranch? This Is the One! Pride of Ownership shines inside and out - from the exotic Slab Granite countertops in the kitchen & master bath, to the idyllic moss rock pond and waterfall, to the custom covered back patio - this elegant ranch is a paradise! Coming in 2,804 finished square foot and 3,614 total square feet, with 3 bedrooms+a French door study off the foyer+3 baths+2 spacious living areas and a Unique extra-long Oversized 3 car garage! Finishes & Features of a Model home with Solid Hickory varied plank hardwood floors, Gourmet Kitchen appliances- newly Finished Basement w/ wet bar, storage galore throughout, Unique Oversized 3 car garage, nearly 700sqft. 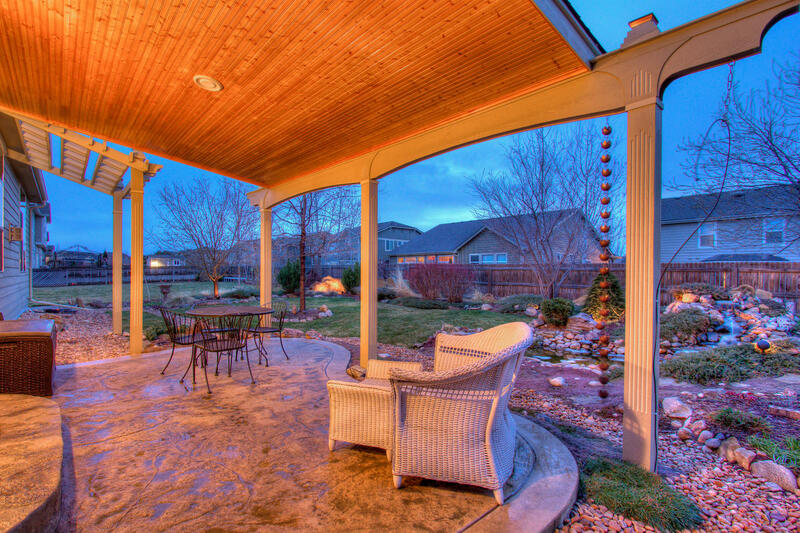 Beautifully landscaped at every turn, enjoy this low maintenance Oasis with unique Colorado plantings, from the expansive stained and stamped covered concrete patio! Gaze up from the patio to see customized knotty pine tongue and groove ceilings on the patio, fluted pillars, and a pergola on the southwest side. Carpets have been upgraded to the high traffic patterned carpet. Entertain for the perfect summer BBQ with an open gourmet kitchen, customized exotic Granite slab, black GE Profile gourmet kitchen appliances (includes dbl wall ovens, dishwasher, microwave, radiant top cooktop and side by side refrigerator), raised panel solid Maple cabinetry with crown moulding and roll-out lower level shelving and in the pantry too! 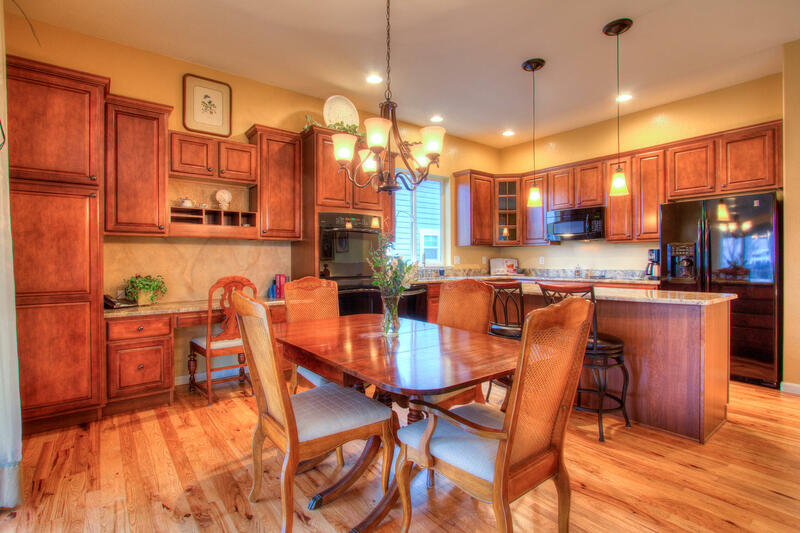 Large convenient center island and upgrade lighting, and built-in desk off the nook! Cozy up next to the gas fireplace with travertine surround, main level has 10ft high ceilings throughout with huge picture windows in the great room and large bay window in the formal dining room. 5 piece luxury Master Bathroom and walk-in master closet, warm and inviting customized paint colors, and Hunter Douglas real wood blinds with gorgeous custom valances! HVAC- newer A/C system, high efficiency furnace, 50 gallon hot water tank, and humidifier. Sink and cabinetry in the laundry room – which include a beautiful front loading Kenmore washer and dryer. 220V in garage, newer Class 4 shingle roof. Koi in Pond, new carpet on stairs to Bsmt & Mstr Bedrm, Kenmore Water Softener included in sale.